Stretching the One Income Dollar: Book Review: Better Homes and Gardens "Cherished Quilts for Babies and Kids"
Book Review: Better Homes and Gardens "Cherished Quilts for Babies and Kids"
Better Homes and Gardens Cherished Quilts for Babies and Kids, is a great book of qulit patterns from babies to teens. The colorful photos are very inspiring, so many awesome designs to sew and quilt! I love the "Cozy Up" quilt with big blocks, so easy, but a pretty quilt. I would love one of these for my bedroom.....this one is done in greens with some brown and blue, but the color combinations are endless and would look equally striking. Very modern. 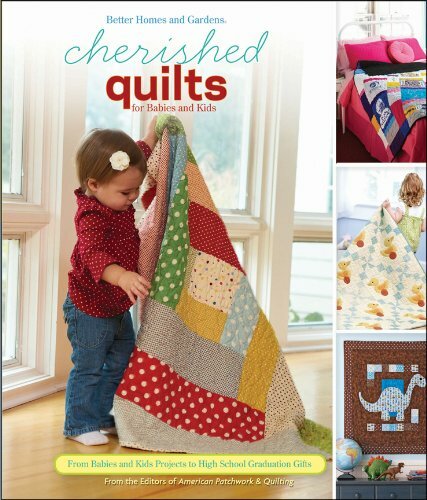 Not only are there quilt patterns in this neat book, but also pillowcase patterns, aprons, bibs, pillows and a backpack. "Oh, Boy!" is another easy, cute quilt, this one for babies, which is done in bright colors. It uses fat eighths, and fat quarters. This book has spiral binding, which is ideal when you are working on a project, no bending your pages. It also has a pretty cardboard envelope filled with patterns which is attached to the inside of the book. This book gives you a great amount of variety, the quilts are awesome. It is a book well worth buying. I know you'll love it as much as I do.....it will be hard to decide which quilt to make next. I forgot to mention the last chapter has quilting basics, if you have to brush up on how to attach a binding, sew on a applique the information is there. A beautiful book!